Lilith Wozniak reviews a new show about raising children, Russian folklore and how the theatre industry supports mothers. Baba’s Song at the Wardrobe Theatre, Bristol. Baba’s Song weaves its narrative lightly, stringing together a sort of cabaret of motherhood, allowing the show to be gloriously abstract, valuing affect over clarity. It doesn’t matter whether we know exactly what passes between Vasilisa and Baba Yaga. What matters are the feelings of frustration and exhaustion and uncertainty, and so much else, which builds through the play. Taped into a metre square box Jannah Warlow and Kim Heron create a mass of innovative moments which work to to express an experience of motherhood, making the space feel simultaneously claustrophobic and expansive. It rarely goes 10 minutes without them effortlessly creating something I have never seen before, whether that’s talking within their mouths to the sound of a baby transforming into a brain eating itself, to narration mixing with command. These innovations would not work if the performers weren’t incredibly talented, so it’s a good job they are. Both have such a charismatic pull on the audience it makes the you wish to spend hours in their company. This, combined with voices which switch from sweetly melodic to disgusting in a second, bodies whose physical clowning transforms them, and the most impressively stretchy mouth I have ever seen, mean that each experiment is just as entertaining as it is revealing. In exploring motherhood the show doesn’t claim to give strong answers. In fact early in the show it addresses the difficulties caused by people thinking they know everything about motherhood, shown by a fantastic (and funky) Mumsnet song. The one message they do suggest comes right at the end – that all experiences of motherhood are different and all mothers must find their own way of being mothers. The diversity of experience means that even among a group of mothers women can feel isolated, or patronised, or attacked. However the play also points to how motherhood brings women together, with the company themselves united by the fact they all have young children. Following the show there is a post show talk, so makes sense to have a post-review note here, because there are few shows I have come into or out of thinking so much about theatre as an Industry. On the way to the show I read the latest instalment of Victoria Sadler’s annual review of female writers on London stages. With progress still slow and disappointing, it felt significant that In Our Hands are a company coming together through motherhood, when the inequalities experienced by having families is often a reason cited for why women’s careers struggle where men’s flourish. This theme was reflected in the post-show discussion, where writer Lucy Catherine talks about moving from theatre into TV and radio after having children, partially due to a decrease in the respect and attention she was given by theatres and for financial reasons. 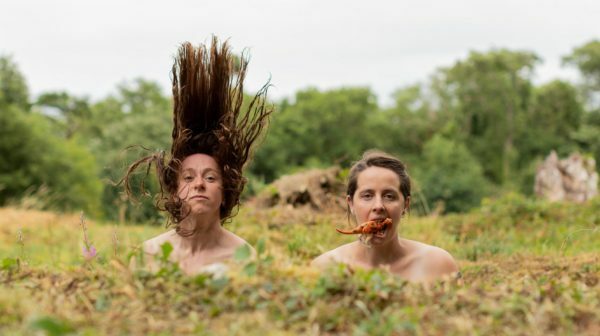 As if further revealing the play’s point about the various experiences of motherhood, two of the other speakers – performance artist Liz Clarke and In Our Hand’s producer Naomi Lange – talk about how becoming mothers encouraged them to go into theatre. There is also a discussion on the panel about those wanting to not be defined as a mother and those who wanted to use it in their art. It does feel like there is some encouraging progress being made in acknowledging and accepting motherhood in theatre. This company met at Mother’s that Make, a group for artists with children. And mothers in theatre are sharing their experiences online, from Tamara Harvey’s #workingmum tweets to Jess Gow’s recent blog. In Your Hands are an interesting and possibly invaluable addition to the conversation. By marrying the content they produce about motherhood and working as mothers themselves, they explore how working practices can better facilitate parenthood and what stories are told about them (and how these two things can affect each other). Even without the entertaining nature of their work, they would be an exciting addition to the theatrical landscape – and with it, they are absolutely thrilling. Baba’s Song was on at the Wardrobe Theatre, Bristol. Click here for more details.